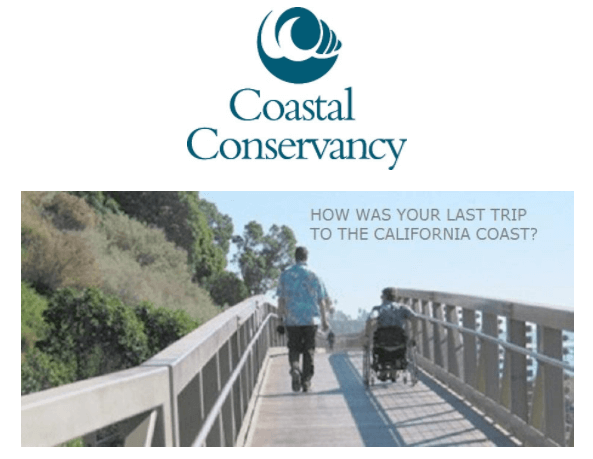 The California State Coastal Conservancy (SCC) wants to hear from you about any access barriers that prevent you from visiting and experiencing the California coast. Please take 10 minutes of your time to complete this online questionnaire focused on removing barriers to access for people with disabilities. Feel free to share this questionnaire which will close on May 18. If you experience trouble filling out the survey contact Tim Gilbert or Laurel Kelly at 510-845-7459. BORP had a wonderful and meaningful impact on the lives of each of my students. Adaptive cycling opened a whole new world to them that they’d never had the opportunity to explore before. Each of my students has moderate/severe physical and intellectual disabilities, so they each require specialized equipment to access physical activity. BORP provided that equipment for us, helped us select the most appropriate adaptive cycle for each student, and then organized and facilitated a ride. My students had a blast! If I had to pick one student who enjoyed his time most, I would choose Darius. 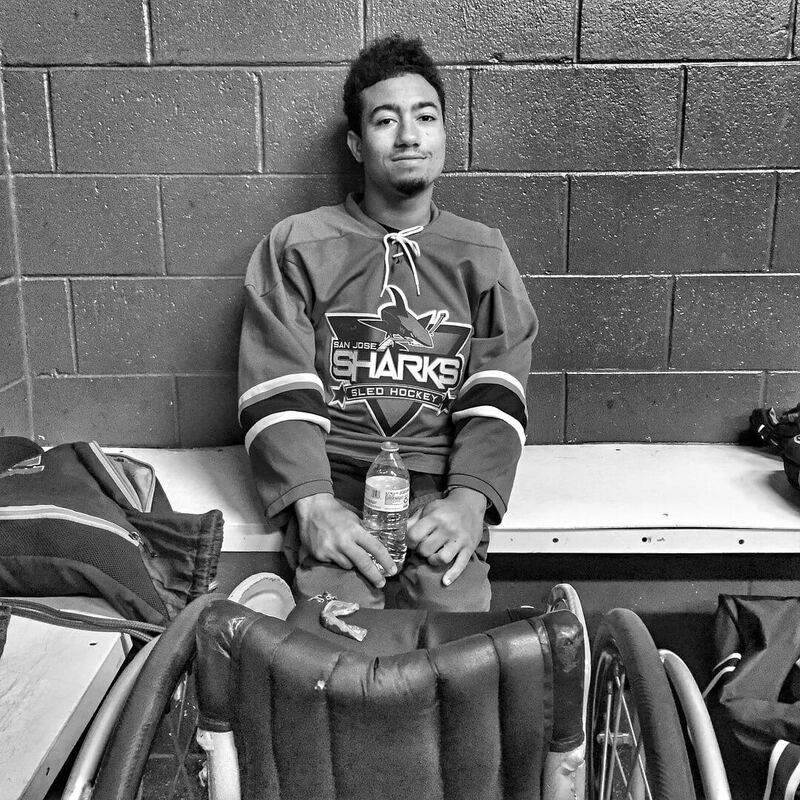 Darius suffers from a neurodegenerative illness that has steadily robbed him of his physical and cognitive abilities over time. In the past, he was a typically developing child who had control over his mind and body. As an adult, Darius is often frustrated because he cannot do the things he used to do as a young boy. 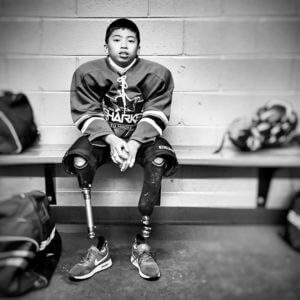 When he was on the adaptive cycle, he seemed to be more happy and free that I’ve ever seen him. 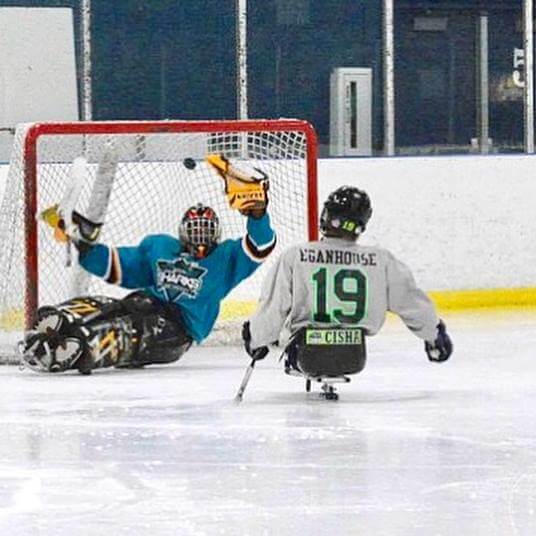 The cycle allowed him to move his legs in ways that he is unable to when he is confined to his wheelchair. He seemed to really enjoy the wind in his hair, moving his legs, and spending time with his mother, classmates, and teachers in a fun environment. The best part of BORP’s cycling program is how invested the staff are to help our students. BORP transported our classroom to and from school using the Borp bus, took the time and energy to help us pick out the most appropriate equipment, helped lift/transfer our adult students using their in-house lift, and then supported us on an adaptive cycling ride. For 10 adult students, this is not an easy task. Everyone at Borp was so supportive and had a great attitude throughout our whole experience. That’s what really made our whole trip even more meaningful. 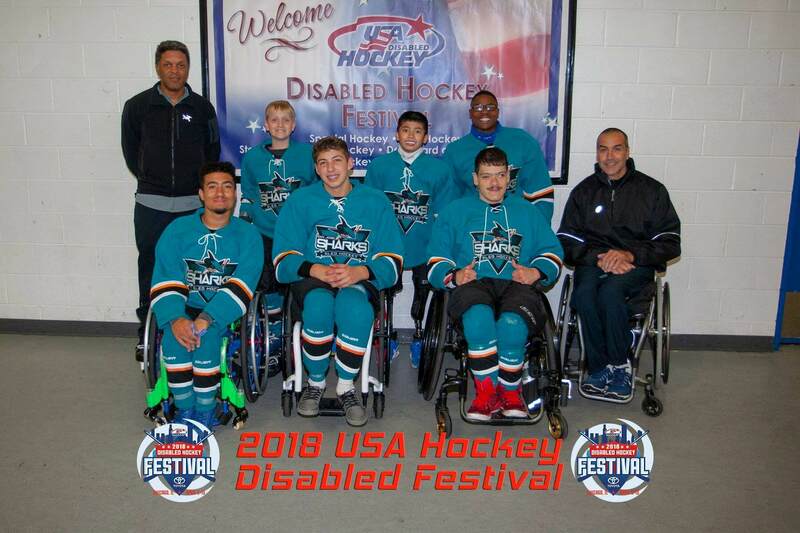 Last week BORP’s youth sled hockey team, the Sharks Sled Hockey, were in Chicago for the 2018 Disabled Hockey Festival. 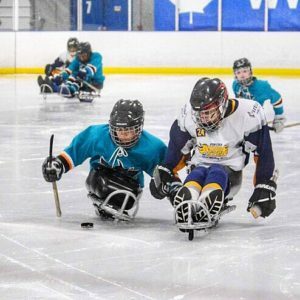 Last year the Sharks debuted at the tournament by winning first place in their division and coming home with a national championship, so excitement was high as the team headed to the Windy City. 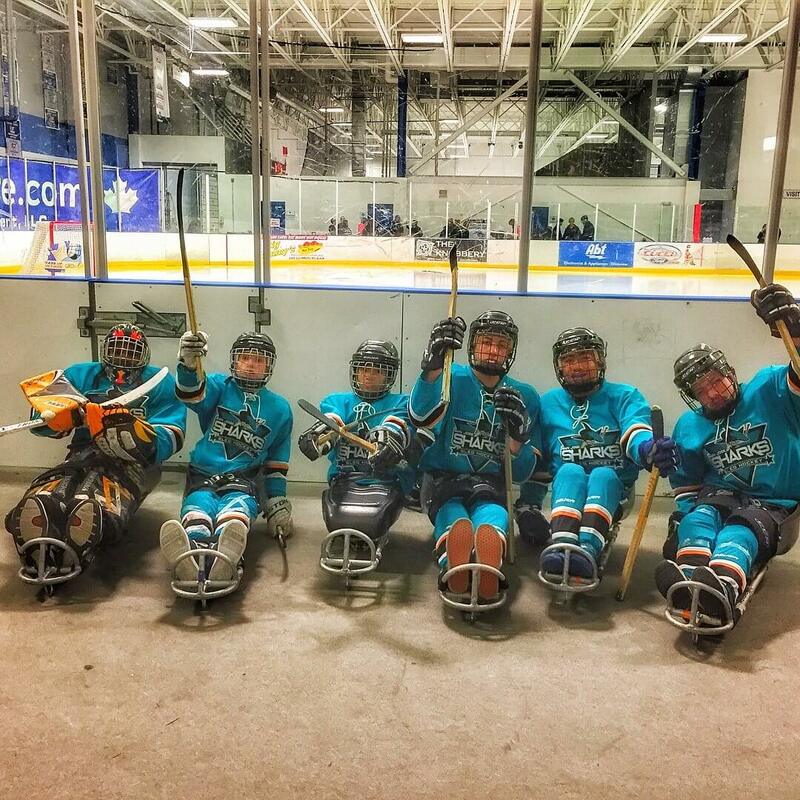 The Sharks Sled Hockey team had a great opening game against the Colorado Avalanche Youth Sled Hockey team. 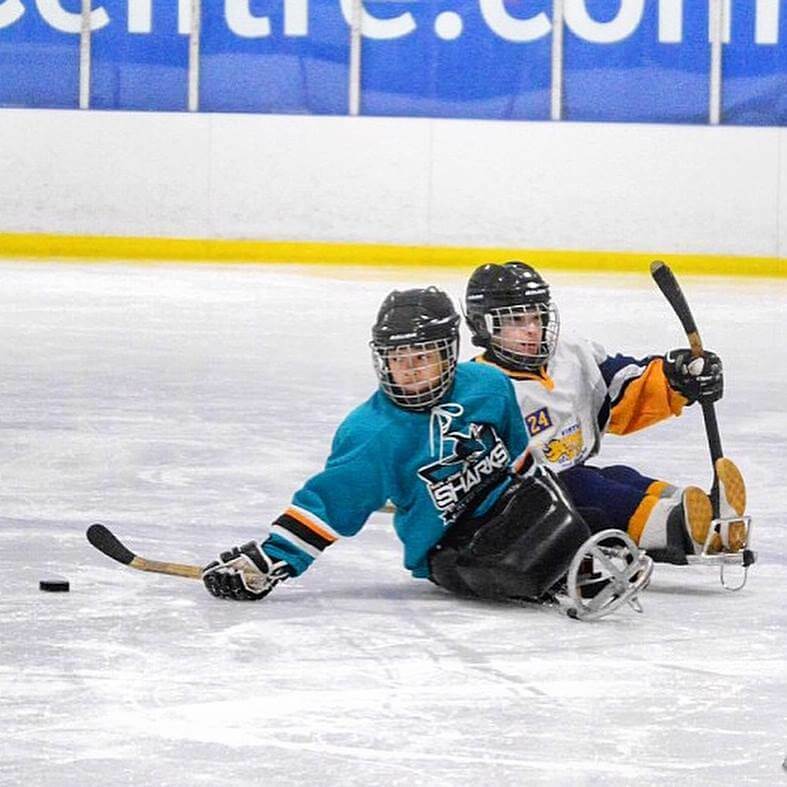 The BORP youth won 10-0, with BORP’s Garnett Silver-Hall scoring four goals. In their second game the Sharks faced Cincinnati and Zach Nazareno, one of BORP’s youngest players, scored four goals leading the team to another win, 8-0. The team went on to finish pool play undefeated after a 3-1 win against the Chicago Thunder and advanced to the semi-finals. 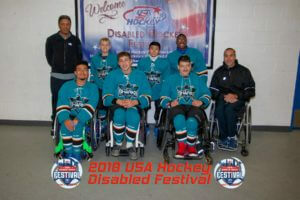 In semi-finals the Sharks Sled Hockey team defeated Chicago Wings of Steel, 5-2 and prepared to face Pittsburg Penguins. The Sharks played hard in the final game for the Youth C Division Championship and ended up losing 2-1 and finishing second place in the tournament. 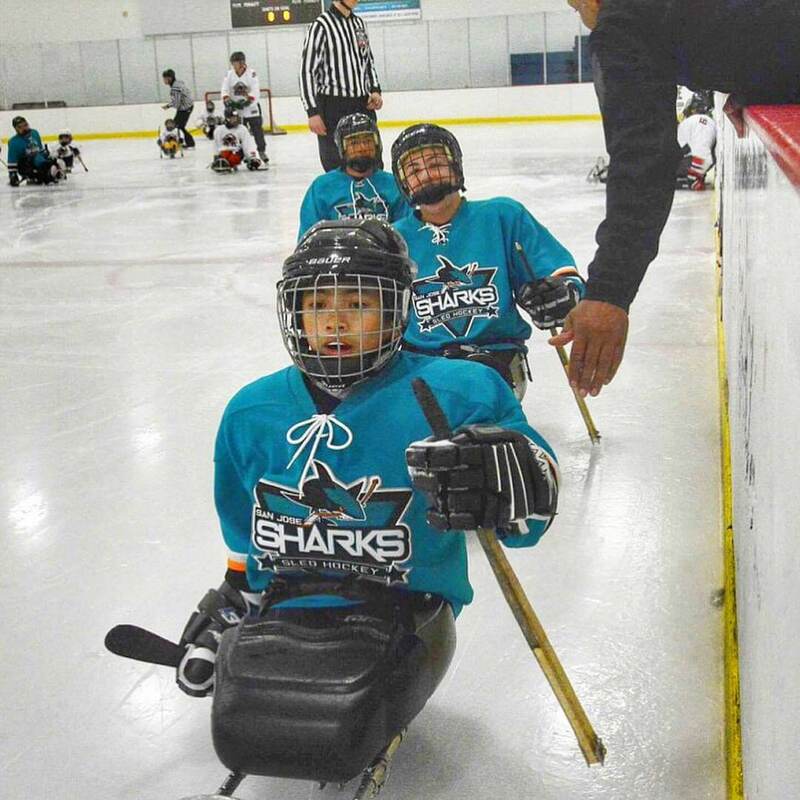 The Disabled Hockey Festival was an incredible experience for the BORP youth and we would like to thank Kristi Yamaguchi’s Always Dream Foundation, the Oakland Ice Center Operated by Sharks Ice, the Sharks Foundation, and the many BORP supporters who made this possible. 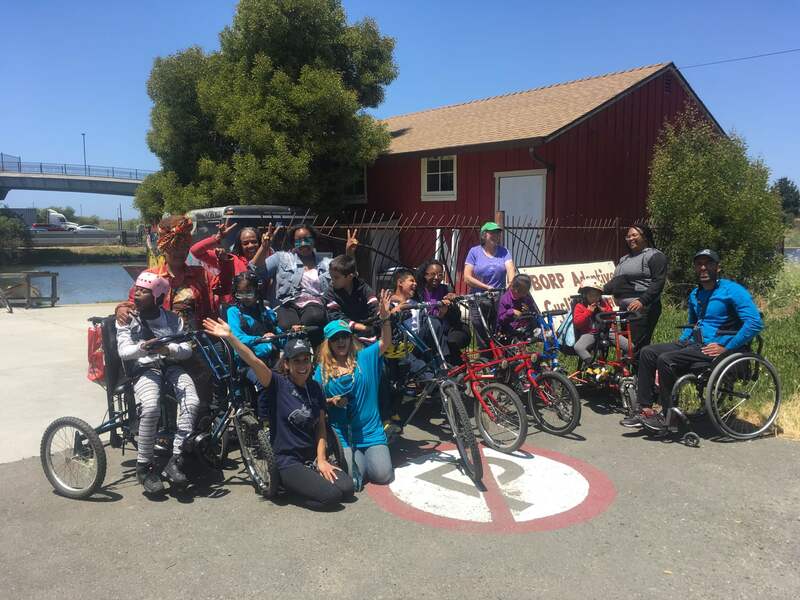 Over the last three years, BORP Cycling and the Centre for Neuro Skills in Emeryville (CNS) have developed a great partnership serving both our missions. CNS is a residential rehabilitation program for people with traumatic brain injuries, spinal cord injuries, and strokes. Every Tuesday, a group of CNS clients and their therapists visit the BORP Cycling Center for a group ride. Most riders come for several months while they are enrolled in CNS programs and some continue to come independently afterward. 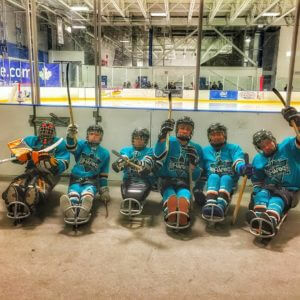 “BORP provides additional recreation therapy for our patients and provides a physical activity in community-based areas. There are plenty of articles and studies showing the benefits of outdoor activities including motivation to exercise, enhancing a positive attitude and emotion, and reducing mental fatigue. BORP allows a break for patients who undergo intense therapy in a clinical setting for hours a day while still getting a different type of rehabilitation. Bicycling outdoors allows patients to feel a sense of community involvement through social reintegration and inducing a mindset of belonging and being able to see their progress in a practical setting. Another aspect of bicycling outdoors is the exposure to sensory experiences by seeing the bright grassy areas, the sunny skies, and vast bay area water. Participation has given our patients a sense of a “reset” that allows them to continue their formal therapies refreshed. We interviewed CNS “graduate” Ray Ydoyaga about his personal experiences at BORP. 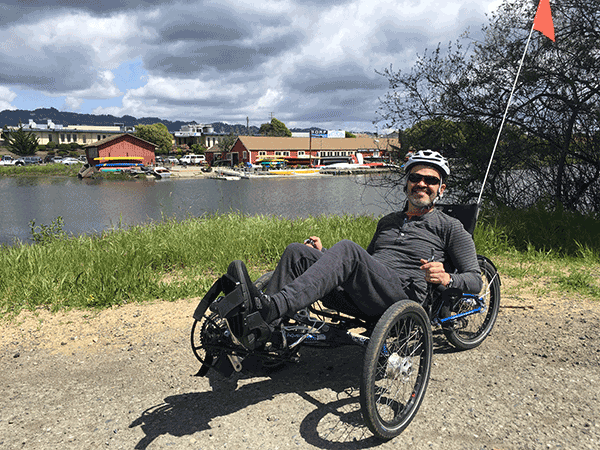 Ray started out riding recumbent cycles with the CNS group, has become a regular independent rider, and just this month successfully got back on a two-wheel cycle. BORP: What do you enjoy about BORP? Ray Ydoyaga: It’s great to be able to have a regular and fun outdoor athletic workout after a major physical injury. This wouldn’t be possible for me without BORP’s special adaptive bikes. BORP is also ideally located at the juncture of multiple bike trails ranging from the very easy loop around Aquatic Park Lake, to hidden paths around Berkeley marina, and to challenging and serious rides up to either the Bay Bridge bike path or, going the other direction, Richmond, and all offering stupendous views. Pre-accident, I was a daily cyclist, so now post-accident, being able to do something physical again that i love has given me a lot of hope and improved my mental well-being. BORP: Have you noticed a specific impact on your physical rehabilitation? Ray: The repetitive cycling motions have definitely increased my strength, endurance, balance and overall mobility. My right side is still substantially weaker than left, but the regular cycling has given the right side a big boost. BORP: What brought you to BORP? Ray: In July 2016, I had a high-speed bicycle wipeout that caused a concussion and a spinal cord injury at neck level (C3). That level of injury almost always means being (required to use a wheelchair), but through luck, years-long rehab work and the care AND INGENUITY of a great physical therapist, SEAN REYNOLDS OF CNS, I am able to walk — with a pronounced limp and sometimes looks a bit like a drunken sailor, but still, it’s a self-propelled walk nonetheless. I have improved to the point where I will be taking my first solo ride on a regular two-wheeled bike very soon, and perhaps graduating from BORP’s fast three-wheeled trikes. 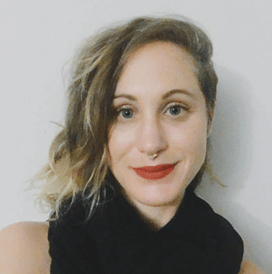 Long-time ​BORP​ fitness studio​ instructor, Jess Schlesinger will be offering her class two nights per week. Starting May 1st, Access Centered Yoga for Trauma and Pain will be offered Tuesday nights at 7:30-8:30 ​pm in addition to Thursdays​. This is ​a ​ donation based class, so students can attend for free and donate what they can​,​ when they can. You might be thinking enough already with the rain but the wildflowers are saying bring it on. 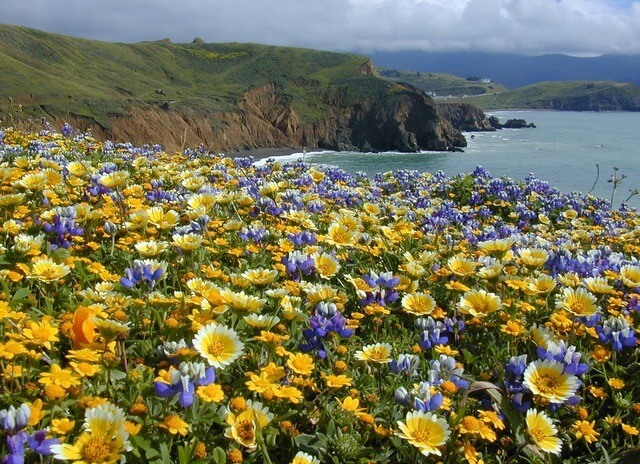 It’s that time of year when people flock outdoors in search of the best places to see wildflowers. With our late rains, this year could prove to be dazzling. 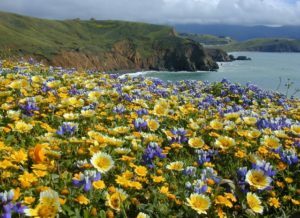 While I have not yet been in search of them this year I have in past years found that both Sunol Regional Wilderness in Sunol and Mori Point in Pacifica have been good choices for wildflower viewing. The Camp Ohlone Road trail at Sunol is hilly and for a manual chair user would require good upper body strength. The surface is aggregate with firm underlayment. Mori Point is flat and easy. Both places have accessible restrooms and parking. If you’d prefer seeing the wildflowers from a moving vehicle you might want to head over to Niles and board the Niles Canyon Railway Wildflower train. This diesel powered locomotive travels through Nile Canyon and leaves from either Sunol or Niles, every Sunday, several times a day. Fare is $14 for adults, $8 for youth ages 3-12. A wheelchair lift is available for boarding and accessible restrooms are at both boarding points.